Description: This work presents in detail a description of archaeological data from the Iron II temple complex at Tel Dan in northern Israel. Davis analyzes the archaeological remains from the ninth and eighth centuries, paying close attention to how the temple functioned as sacred space. Correlating the archaeological data with biblical depictions of worship, especially the �textual strata� of 1 Kings 18 and the book of Amos, Davis argues that the temple was the site of �official� and family religion and that worship at the temple became increasingly centralized. Tel Dan's role in helping reconstruct ancient Israelite religion, especially distinctive religious traditions of the northern kingdom, is also considered. 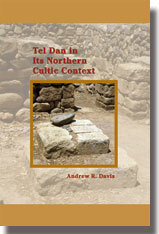 Citation: Aren M. Maeir, review of Andrew R. Davis, Tel Dan in Its Northern Cultic Context, Review of Biblical Literature [http://www.bookreviews.org] (2015). Citation: Bob Becking, review of Andrew R. Davis, Tel Dan in Its Northern Cultic Context, Review of Biblical Literature [http://www.bookreviews.org] (2015).